If we were having coffee, I would only have a breakfast blend to offer you today. I’m having coconut creamer in mine. I never knew coconut creamer existed until the other day when my wife brought some home. I think I like it. I wish I could offer you a new coffee we have been drinking over the last week by Lavazzo. 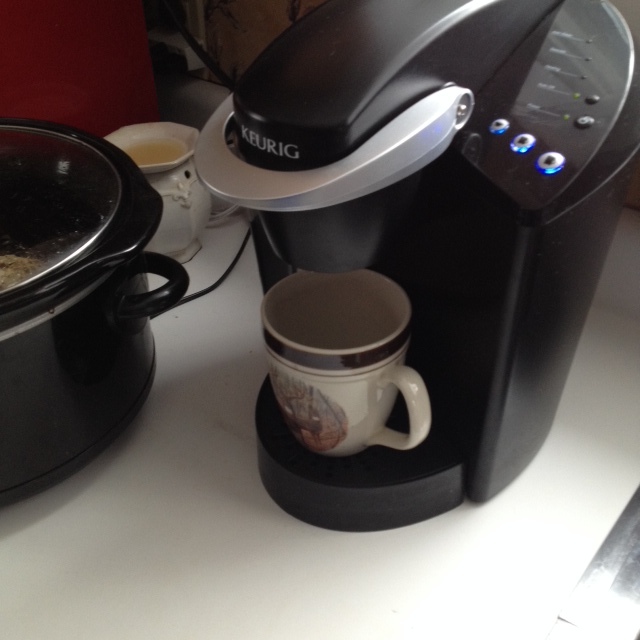 It was an Italian Blend and has to be the best coffee I’ve had yet in our Keurig. It’s gone now and our local market is already out of it. It feels good to say hello this morning because I haven’t posted in a few weeks. The week before last, I worked in Houston for the entire week and had a lot do there in a short amount of time. I got there on Memorial Day and was there for all the big storms and flooding. I was fortunate that the only flooding I witnessed was an underpass near my hotel where two freeways intersected. A slight detour for me the first morning of work was my only inconvenience. So many others there weren’t so lucky. If we were having coffee, I would tell you I got back in time to see my youngest son play baseball on Saturday and a county scholarship event for my oldest son on Sunday. I’ve traveled enough to know I should leave a day buffer for important events. There was a second scholarship event at my son’s high school on Tuesday night this week and between the county and local scholarships, my son did well. He won three different scholarships. The one I was most proud of him for was the one awarded to the top two girls and top two boys of his graduating class. We live in a small community in one of the less affluent counties in New York yet between the county and his local high school, we witnessed well over three hundred thousand dollars being awarded to kids. At just his high school, almost fifty percent of his graduating class received something. That is amazing and a continual reminder to me of how our community gives back. We are truly blessed. If we were having coffee, I would tell you I’ve been making time to read but haven’t been writing for the last month. There’s just been too much going on. I’m OK with that. No self-imposed deadlines to stress me out. I will make time in a few more weeks after my son’s graduation. I have a short story to wrap up and send off to my editor than back to work on my novel. I read a great article on the plane last week about outlining and decided to try a few of the author’s suggestions. Winging it has been somewhat of a departure from my technical training (day job) and I can see where a little more structure could save me time. Even with an outline, there’s always room for creative tangents. If we were having coffee, I’d tell you I need to cut it short today because I really should mow our yard. I would put it off until tomorrow after work but the forecast is for rain. I love sitting on our back porch during the rain and there’s just something about a freshly cut lawn that enhances the experience. Everything is so green right now and the woods behind our house are full, leaving only little openings where we might catch a glimpse of a deer or two. Birds are another story and this time of year we see, and just as importantly, hear so many. I’m not a bird watcher but I am starting to become familiar with their chirps. I think I successfully talked back to one the other day. Well, at least in my mind it was a success. I’m also taking the time today to sit down with one of my son’s classmates who is also a dear family friend to us. Just a little guidance through the whole college application/financial process to help her see how it’s very doable. Thankfully I’ve learned quite a bit about this over the last seven or eight months and she still has time. The coffee was just as good Bill. Coconut creamer sounds interesting. Never seen it here in the UK. Glad all was OK for you after the awful weather you experienced in Texas. Thanks Hugh! If you happen to find that creamer somewhere it is worth trying. We have so many flavors here in the US that I think we take it for granted, unless one prefers their coffee black of course. I only have cream in my first two cups each day then my third is black. Odd habit I’ve formed. Texas was scary. Especially watching the news each morning before I venture off to work but it all worked out. I’ve successfully (in my mind) talked to birds as well. I have been noticing their different chirps around here as well. I live in the city center but there are still lots of trees that are frequented around here. There’s also a river with a lot of green areas around it, so there’s some nature. I wonder about the outlining method you read. Maybe you could share some pointers. I like to outline, but I don’t have a method to it, and I feel that maybe I should. A little late in answering posts. I will post something on outlining. I read the article and my wife also bought me the author’s book. I could also scan the article and email it to you if you’d like. It’s awesome that you’re taking the time out to help your son’s classmate and friend with her college apps. That’s a really stressful time, and it’s always good to have help. Sounds like you’ve been busy, and luckily you manged to stay out of harm’s way when in TX. Hope things settle down a bit for you soon. I’ve been drinking Dunkin’ Donuts Coconut flavored coffee, and I love it! I’ll have to check out the coconut creamer. It sounds like you have your priorities firmly in order. The writing will come when it’s meant to come. The moments you are having with your family now cannot be repeated, so you are right to savor them! I’m so glad that you are helping your son’s friend. It is a very confusing process and even when you have gone through it, things change and it can be very frustrating. Helping her is great! It can be very confusing and now I feel like somewhat of an expert, lol. It will sure make it easier when it is time for my youngest to go. Not much on flavored coffee unless it’s mocha. Anything chocolate is good. 🙂 Glad you survived the weather. My kids are in the DFW area. Hope you got the grass mowed before the next rain. Love mocha coffee and lattes. The grass is a never ending thing up here. Timing it between rains can be the challenge. I’m currently drinking Southern Pecan flavored coffee with Sweet Irish Cream creamer. A little sweet, but just what I needed this morning. As always, a lovely post, Bill. Thanks Robin. The more I listen to them, the more surprised I am at familiar sounds. I can’t attribute it yet to any specific bird but I’ll get there.